In preparation for the Holiday season DigitalRoom.com is sponsoring a giveaway for my readers. The giveaway is for a 16x20 Rolled Canvas Print. Rolled canvas prints are perfect for home decor, photo prints and signage. 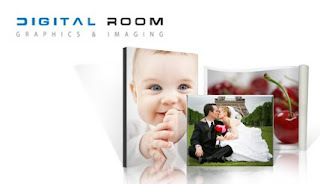 Check out all the Canvas Printing options at DigitalRoom.com. You can also read a review on Uprinting by visiting YoutheDesigner. Mandatory Entry: Tell me what picture you would like made into a 16 X 20 Print. 5. And for 5 extra entries blog about this giveaway, linking back to this post and to DigitalRoom.com. RULES: Giveaway is open to US Residents only. Free UPS Ground Shipping. Giveaway ends November 22, 2009 at 11:59 PM. Winner will be chosen via Random.org. Must have valid email in their blog profile or leave email in comments otherwise you will be disqualified. DISCLAIMER: As the host of this giveaway DigitalRoom.com will be awarding me with a 16 X 20 Canvas Print also. PIck me pick me pick me!!! A photographer friend just volunteered to do a portrait of our family--What perfect timing would that be??? I took a photo of my kids together that I would LOVE to print. I would love a family photo for the canvas. I would put one of our family photos we just had taken on October 4th. I would love to have a print of our wedding photo's! I would print a photo i took of a sunrise this summer. I put your button on my sidebar #1. I would do a photo of my boys, it would nice to have a nice sized photo of them on the wall. We just had family pictures taken and one of these would be lovely on the blank wall that has mocked me for the past 2 1/2 years of living here. Now following your blog via google friend connect. I just had a gorgeous picture of my four boys taken and I'd love to have it blown up. We would have to attempt a family portrait with the 3 little ones!! There is a photo of my son when he was 2. It was taken from behind as I was holding him and he is sucking his thumb. Just one of those "mom" moments that just sums it all up. It would be insane as a canvas. Definitely a picture of my son, not sure which one at this point, but he is 2! I would love a huge, formal picture capturing my baby!! I would put a picture of my family all lounging together in a hammock. I would choose a pic of my two boys--one of the only ones where they are both smiling! A picture of my son when he was a newborn. It was only 7 months ago but it feels like an eternity and I always want to remember how innocent and pure he was at that time in his life....absolutely precious! If I won, I would blow up a picture of my 2 boys! I do not have any yet hanging on my wall! How did I almost miss this? I would get a photo of my SIL family and give it to her for her birthday. My kids at the beach! I took a picture of little one and the Hubs fishing off of a dock this past summer, it's the cutest thing.